Apple apologists' brief respite is over. Late last week, IHS iSuppli and Strategy Analytics released first quarter data putting Samsung handset shipments ahead of Nokia, ending the Finnish company's 14-year reign. But the analyst firms couldn't agree on smartphones, with Strategy Analytics positioning Samsung ahead of Apple, but IHS giving the nod to iPhone. The Apple Fanclub clung to the "We're No. 1!" data, unsurprisingly. 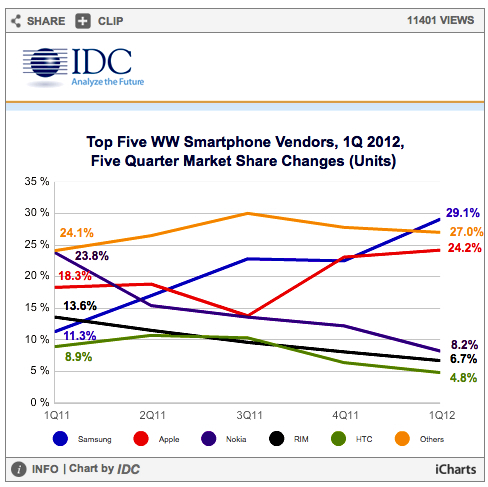 But the last word comes today from IDC, which corroborates Strategy Analytics, crowning Samsung king in both categories. "The halcyon days of rapid growth in the smartphone market have been good to Samsung", Kevin Restivo, IDC senior research analyst, says. "Samsung has used its established relationships with carriers in a mix of economically diverse markets to gain share organically and at the expense of former high fliers such as Nokia". Strategy Analytics puts Samsung's Q1 smartphone shipment at 44.5 million, compared to Apple's 35.1 million, IHS says 32 million for the South Korean electronics giant. IDC's number is way closer to Strategy Analytics, but not as high: 42.2 million. Samsung ended the quarter with 29.1 percent share to Apple's 24.2 percent, according to IDC. Market share rose a stunning 267 percent, lifting Samsung from fourth to first place year over year. However, in the broader handset market, change was 35.4 percent. Apple rose 88.4 percent broadly and 88.7 percent in smartphones. Together, Apple and Samsung accounted for all the growth in smartphones among the top five during the quarter, dramatically taking it from all the major vendors, including HTC, Nokia and Research in Motion. However, the "other" category grew by 59.6 percent, lifted by some Chinese name and white box manufacturers. "The race between Apple and Samsung remained tight during the quarter, even as both companies posted growth in key areas", Ramon Llamas, IDC senior research analyst, says. 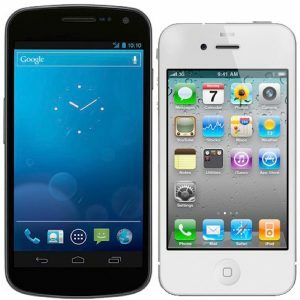 "Apple launched its popular iPhone 4S in additional key markets, most notably in China, and Samsung experienced continued success from its Galaxy Note smartphone/tablet and other Galaxy smartphones". He emphasizes: "With other companies in the midst of major strategic transitions, the contest between Apple and Samsung will bear close observation as hotly-anticipated new models are launched". Samsung will beat Apple to new model launch, during an event scheduled for Thursday in London. Disaster wouldn't strongly enough describe Nokia's quarter. Handset sales plunged 23.8 percent year over year and more severely for smartphones -- 50.8 percent. This tremendous share loss comes during the first full quarter of Lumia Windows Phone sales. Last month, I wrote "Nokia does the Windows Phone death dance". Nokia's Q1 performance makes my analysis look faint. Emerging markets, China among them, where Nokia once was overwhelmingly dominant, greatly contributed to share declines. Apple and Samsung saw strong sales growth, particularly in China. Research in Motion and HTC loses were severe, even if less than Nokia's -- 29.7 percent and 23.3 percent, respectively. An early leader among Android licensees, HTC can't keep pace with Samsung. The manufacturer had a particularly hard quarter in the United States, which Asia-Pacific performance somewhat overset. Broadly, global handset shipments declined 1.5 percent during first quarter -- 398.4 million units from 404.3 million a year earlier. By comparison, smartphone shipments rose 42.5 percent year over year but nowhere as strong as the holiday quarter's 57.4 percent. Growth beat IDCs forecast by 1 percent. Manufacturers shipped 144.9 million smartphones compared to 101.7 million a year earlier.